Turning center or lathe programming follows much the same techniques as those used for machining center programming. 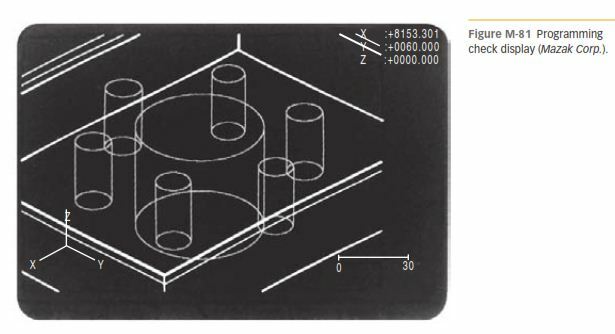 A part drawing must be studied to determine the sequence of machining operations and the cutting tools required. The programmer must be familiar with the material being machined to select appropriate feeds and speeds. Once again, as in milling, programming should be done with an eye toward maximum productivity in cutting tool and workpiece positioning as well as the types of cutting tools used, feeds, and speeds to fully realize the maximum productivity of the CNC turning center. 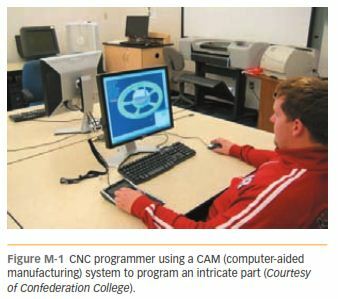 CNC Lathe Programming Example The workpiece shown in Figure M-58 requires many of the common turning operations typical of the CNC turning center. The program (Figure M-59) has been developed for the EMCO CNC lathe (Figure M-60). 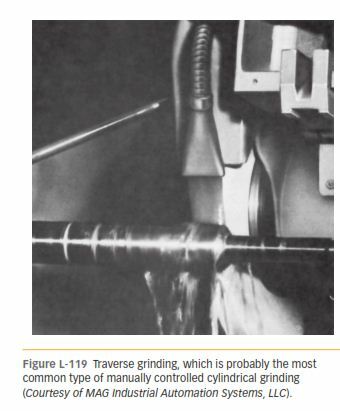 The machining involves cylindrical surfaces, tapers, radii, and threads. We will look at the main portions of the program and explain how the code is converted into machine moves and actions. away from the chuck as the zero position. During the setup process, the machine operator selects this location as Z 0 and the centerline of the spindle as X 0. Because the drawing is dimensioned with diameter values, it simplifies dimensional input. Programmers and machine operators like the different tools that are being used in a program to be identified easily. A simple way to do this is to use an obvious sequence number, such as an even 100 number. O1200 The first entry in a program is the program number; in this case it is O1200. N100 A G20 designates inch input. N110 G95 makes feed rate inputs as inches per revolution. turning tool and a boring bar. Tool offsets also account for different tool nose radii, and as tools wear during machining, offsets are being adjusted to maintain workpiece accuracy. If a cutting insert has to be exchanged during a finish machining operation, its physical size varies from the original one and requires an offset change. A G40 is always programmed to happen during a noncutting move, as during rapid travel to or from the tool change point. 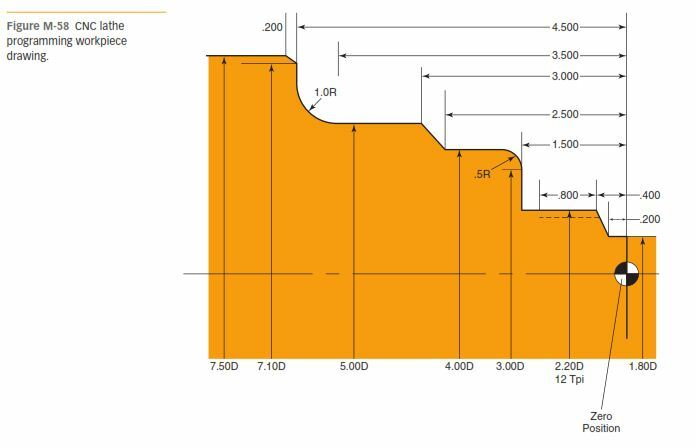 The G50 at X12 and Z18 is a reference point for the machine in relation to the workpiece.